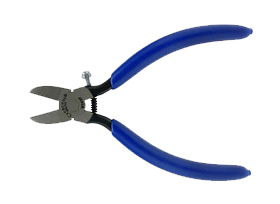 These premium cutters are specially designed and manufactured for plastic gate. 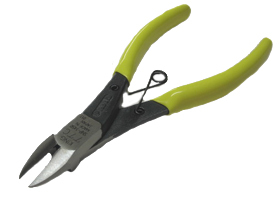 They are ideal for a wide range of plastic cutting and trimming applications. SNP-145R 5-3/4" .063" Oval 5/8" 1-1/4" 1/2"
PN-125F 5" .047" Flat 12/16" 5/8" 1/4"
PN-150F 6" .063" Flat 7/8" 7/8" 1/4"
PN-175F 7" .079" Flat 15/16" 1" 5/16"
AN-150B 6" .079" Flat 90° 5/8" 3/4" 1/2"
Available overall lengths: 5", 6", 7"
Packaging: Five premium cutters per kit. 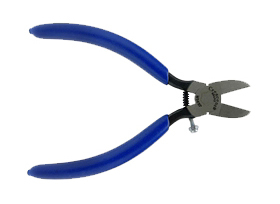 These plastic cutters are designed and manufactured to the highest quality standards. 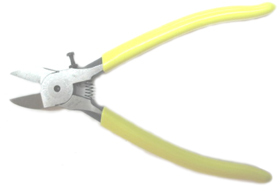 They provide high reliability and efficiency in a wide range of plastic cutting and trimming applications. 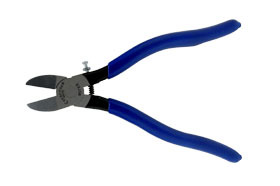 They are ideal for repetitive cutting while removing gates and spurs from molded parts. 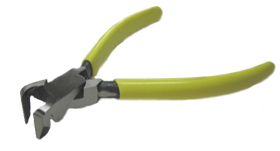 Sharp, flush ground cutting edges, flush ground cutter backs, and a selection of head designs permit close trimming and accurate cutting in confined areas. Blue "puffy" handle grips and handle springs provide user comfort. Choice of models with right- or left-hand ergonomic handle designs to reduce fatigue from repetitive cutting while increasing productivity. MS549J 4" 33/64" 27/67" 1/4" 7/16" 1/8" 3/8"
P55 5" 49/64" 5/8" 11/32" 9/16" 5/32" 3/4"
P56 6" 53/64" 23/32" 13/32" 7/8" 1/4" 13/16"
P57 7" 1-1/16" 55/64" 15/32" 1-1/16" 5/16" 1"
P56RP 6" 27/32" 23/32" 13/32" 7/8" 1/4" 13/16"
M57RP 7" 1-3/32" 29/32" 31/64" 1-1/18" 5/16" 1"
M57ER 7" 1-1/16" 59/64" 1/2" 1-1/8" 5/16" 1"
P4-3 4" 41/64" 37/64" 11/32" 17/32" 3/16" 5/8"
P5-3 5" 25/32" 5/8" 23/64" 9/16" 5/32" 3/4"
P6-3 6" 27/32" 47/64" 13/32" 7/8" 1/4" 13/16"
Starter kit contains five different models of cutters ideal for close trimming and accurate cutting in confined areas. 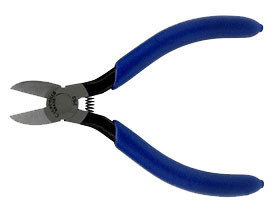 Each cutter is uniquely designed to efficiently remove gates and spurs from molded parts. 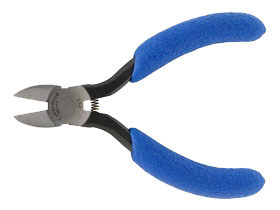 Packaging: Five cutters per kit. Available overall lengths: 6", 7"
Available overall lengths: 4", 5", 6", 7"
Available overall lengths: 4", 5", 6"